Finally the rain everyday theme is coming to an end. While we will get a thunderstorm or two on Friday, most of Friday and the rest of the weekend will be precipitation free. After hitting nearly 80 degrees on Friday we will hover in the mid 60s for Saturday and Sunday. Nothing stopping us! As always, click on the title for more or detailed information on the event. Most of the events were pulled from our event calendar where you can find hundreds of local area events each month. The event calendar is FREE, so if you are a local business, and not taking advantage of FREE publicity, shame on you! Are you a local business and want to sponsor this high traffic, weekend guide? Contact info@newbedfordguide.com for more details. Have an event to add? Add it here. Know of another event this weekend? Post a reply! Come and join six of your local Lularoe consultants to freshen up your wardrobe for spring/summer! That means THOUSANDS of pieces of LULAROE!!!!! You will be able to try on and feel all of the Lula you want! You’re not going to want to miss this!!!!! Bring friends and family with you to check it out! FREE admission and kid friendly! 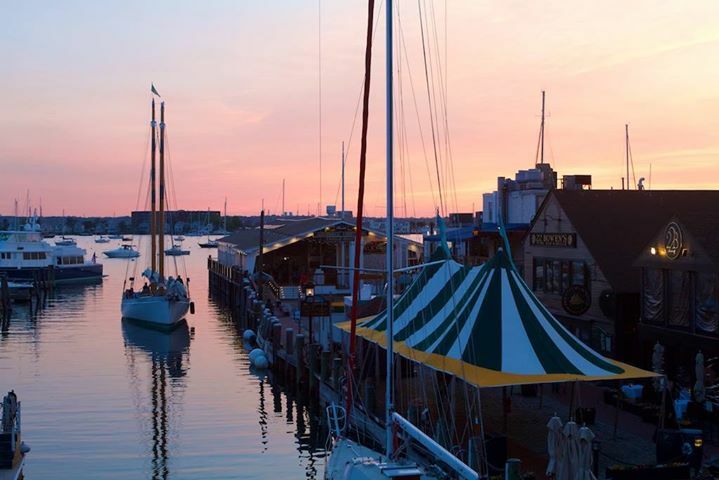 The Newport Oyster Festival has arrived! Mingle with a small group of 8 growers under market lights, festival tents in this historic district known for shopping & waterfront dining. Sip Moët Impérial, the House’s iconic champagne while you savor locally grown, farm fresh Rhode Island oysters: they’re delicious, nutritious and good for the environment! (Just ask The Nature Conservancy in Rhode Island about the 2 tons of shell they collected from us last year and the reef-rebuilding project in South County, Rhode Island. Guests will be served signature Oyster Festival drinks and a variety of different oyster based delicacies from the Ocean State’s best chefs — a true ocean-to-table experience. Or better yet Motors & Mansions! Join the Preservation Society of Newport County and the Audrain Automobile Museum for one of the most unique Cars & Coffee around, Located on The Elms beautiful grounds! Motorcycles & scooters welcome. Registered cars enter the Bellevue Avenue gate. All others enter the grounds from Perry Street. Due to the lawn size participant registration will be limited to 200 cars. 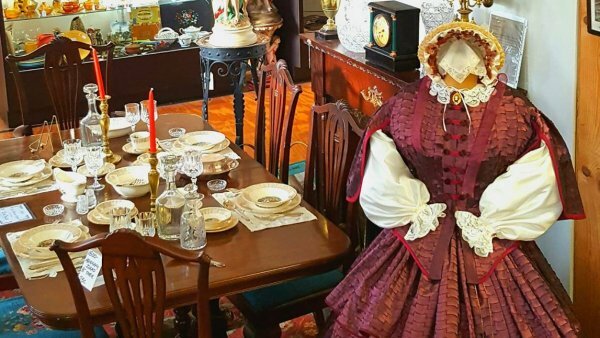 Find some local treasures at New Bedford Antiques at Wamsutta Place this weekend! Grab your friends, classmates, neighbors and colleagues to form a Cleanup Team! Teams work together in areas that are always trashed, are a blight on our neighborhoods or harmful to wildlife. Come alone, join a Team or go the extra mile and sign up as a Team Captain, you can even recruit a friend or family member to be a Co-Captain. Decide which area drives you crazy because it’s always so littered and then let us know on the Sign up Now! form. Email info@operationcleansweep.net for details on how you can help Keep New Bedford Clean! Visit http://www.operationcleansweep.net and Sign up Now! The day kicks off with stories, songs and crafts for the park’s youngest visitors (suggested age 0-5) from 10:00-12 noon. Park rangers will be reading stories and singing songs about whales and the sea, and offering a hands-on related craft to take home. The fun then continues from 12:00-2:00 pm for children ages 5 and up with an exploration of the park through the park’s Junior Ranger booklet. The Greater New Bedford Home, Health & Wellness Show is one of the largest and most promoted events of the year! This is an ideal way for more than 2,000 area residents to learn about and connect with local home, health and wellness service and product providers. Businesses are provided with multiple opportunities to promote their business and showcase their expertise. Don’t miss this special event at the Zeiterion! Join us for the 23rd Annual Massachusetts Youth Pride Festival, a collaboration of BAGLY and Boston Pride, and 37th Annual BAGLY Prom! Check-in/Registration 9:30-10:30am. Festival 11:00am-4:00pm. Parade 12:00 noon-1:00pm. BAGLY Prom 4:00-7:00pm. Don’t forget to join us after Youth Pride for the BAGLY Prom. This year, Prom will be held outside on City Hall Plaza directly after the festival from 4:00-7:00pm and will feature a cosplay competition! Come dressed as your favorite character for a chance to win a $50 gift card. Antiques, collectibles, and history all in one place! The Center is home to over 200 dealers and consigners featuring antiques and collectibles from early Americana to Mid-Century to today’s treasures. With specialty stores within the Center which include a flower shoppe boutique, an ephemera store, the cast-iron store and vintage clothing. The Center is also the largest antique consignment venues in the Southcoast Region. So if you have one piece or an estate full of treasures , the Center will preview your items and consign them. The staff has over 100 years of collective knowledge in the antique trade from buying to selling to refinishing to retailing. There are public bathrooms, the center is handicap accessible and, pet-friendly! Phone: (508) 991-8700. Wamsutta Place, 61 Wamsutta St., New Bedford. Lonestar and Parmalee headline. In addition to our headliners, the music starts at noon with local talent Kathleen Regan, Southern City Band, Houston Bernard Band, Alec MacGillivray, and Devri Gone Country with the Big Bamboo. Also being offered: a $2,500 Corn Hole Tournament which start at 1:00 P.M. Great beverage & food offerings from BBQ to Tex Mex. Fun for the entire family with the Largest Inflatables to riding the mechanical bull and if you need some gear, the vendors will be offering everything from Cowboy hats to boots! Master chef Jacques Pépin is world-renown as a French chef, television personality and prolific author. He has published more than 25 cookbooks, hosted 14 highly acclaimed public television shows and taught millions of Americans – plus an entire generation of chefs — how to cook. His innovative approach to the kitchen begins with technique and ends with creation, believing that every meal should be a celebration. The success of his book, La Technique, prompted the launch of the acclaimed 1997 PBS series, The Complete Pépin. It was followed by the Daytime Emmy® Award-winning Julia and Jacques Cooking at Home with Julia Child. Join us for a unique opportunity to watch a live food demonstration by one of the world’s most beloved chefs along with sous chef and daughter Claudine Pépin. The Fall River Young Marines will be hosting a “Motorcycle Pride Ride” Bike Run to Celebrate America & our Veterans, while raising funds to benefit their Tax Exempt 501(c)3 local youth program aimed at leading youth towards a healthy, drug free life-style. We will also be having family friendly activities for all ages, food, shopping, & a car / bike show for those not wishing to participate in the Bike Run. Take a step to a healthier you today! 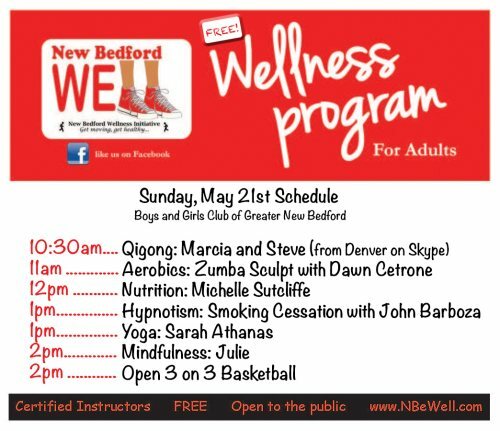 Qigong with Stephen and Marcia Rath (10:30), Aerobics: Pilates with Joan Davignon (11:00), Nutrition: Everyday Wellness with Dana LLC (Noon), Yoga: Joan Davignon (1:00), Hypnotism: Smoking Cessation with John Barboza (1:00), Mindfulness: Jonathan (2:00), and Open 3 on 3 Basketball (2:00pm). Boys and Girls Club of New Bedford, 166 Jenney St, New Bedford. Live music, beer, wine, and the region’s best restaurants, bakeries and caterers showcasing their mouth-watering dishes all in one place and special day. At Pier 3 in New Bedford’s Historic Waterfront. Want to sponsor this weekend guide? Contact info@newbedfordguide.com for more details.